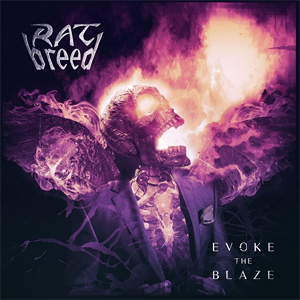 Finnish heavy metal band RATBREED released a second single "Hunting High, Reaping Low" from their upcoming album Evoke the Blaze which is released July 13th via Inverse Records. Stream the new single below. ""Hunting High, Reaping Low" was one of the last songs written on the album, together with the first single "Gates Of Underworld". Can't remember which one came first actually. Lyrically it's about subconscious black hole exploding and repressed inner demons coming to surface." The recordings took place partly at Deep Noise Studios in Kouvola with Mr. Juho Räihä and partly at the band’s guitarman Markus Taipale’s private studio. The album was mixed and mastered by Juho Räihä at Sound Spiral Audio (WOLFHEART, PROFANE OMEN, BEFORE THE DAWN) in Kouvola, Finland.